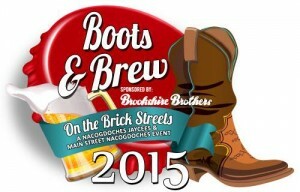 Nacogdoches, Texas- The Nacogdoches Jaycees and Nacogdoches Main Street are excited to announce that tickets for the second Boots & Brew event presented by Brookshire Brothers will be on sale at the Liberty Bell, 422 E. Main Street, in historic downtown Nacogdoches beginning at 11 a.m. Tuesday, September 1st. Slated for Saturday, September 26 th , 2015 from 6 to 10 p.m. the second Boots & Brew event will have a limited audience with only 800 tickets available for purchase, so we encourage everyone to get their $40 ticket early. 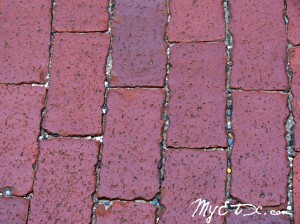 Tickets can be purchased tickets using cash, check or credit card, however organizers encourage cash and check so that event proceeds can be used for downtown beautification and to support the youth of Nacogdoches County. Boots & Brew will feature live entertainment by Soul Track Mind, an Austin based band who was incredibly well received earlier this year at the Big Nac Festival. They will take the Plaza Principal stage at 7 p.m. Ticket prices include both a wine and pilsner tasting souvenir glass. Attendees will have the opportunity to enjoy a variety of both beer and wine samples and chat with industry experts. Different than the Nacogdoches Main Street Downtown Wine Swirl, Boots & Brew will be held on the downtown square and will feature a variety of vendors, including downtown merchants Rhinestone Rifles and Boot Barn. For more information “Like” Boots and Brew on Facebook or contact the Nacogdoches Main Street Office at 936-559-2573 or via email at obriens@ci.nacogdoches.tx.us for more information. 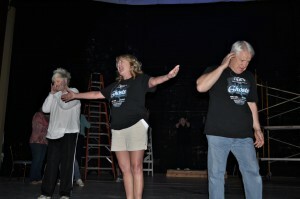 PALESTINE- Palestine Community Theatre (PCT) will bring “Ghosts the Musical to the stage of one of the oldest and most beautiful theatres in East Texas this March beginning on the second weekend of the 75th Annual Dogwood Trails Celebration on March 22. PCT has been preparing for this show since last year with a cast packed full of local talent. Nacogdoches – With less than 50 days till Christmas, and the Nine Flags Christmas Festival just around the corner, downtown Nacogdoches has the holidays on our mind. The City of Nacogdoches Main Street Program and participating downtown merchants are extremely excited about next week’s Holiday Open House, set for Tuesday, November 5th, from 4 to 7 p.m.